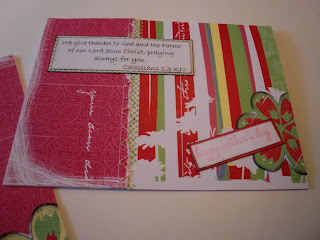 I'm always looking for new and different techniques to use on my cards and scrapbook pages. Sometimes, however, the best ideas come when you revisit old standbys. Sewing on your paper is nothing new, but it's been a long time since I added stitching to a project. Here's how easy it really is. 1. Cut card stock to desired size - this one is 6.25x4.5 inches when folded. Then cut two pieces of decorator paper to fit, making them long enough to overlap. (This is super-important.) Either cut or tear along the overlapping edge to make an interesting embellishment. 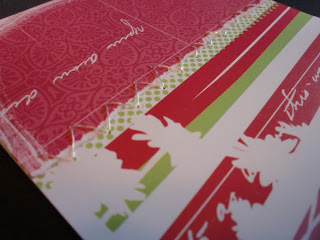 Tape the two pieces together, but not to the card. 2. Using a small sewing needle, poke a series of alternating holes on either side of the overlap. You're going to "lace" the two pieces together, so stagger the holes accordingly. 3. Choose a coordinating color of thread, ribbon or cord and attach one end on the reverse side of the paper. Lace the thread through all the holes, alternating from side to side. When finished, attach the end of the thread to the back of the card. 4. 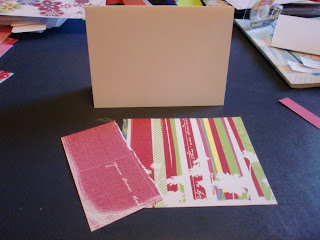 Adhere the decorator papers to the card stock and embellish as desired.